Visiting the local shopping centre. Some are so big that you’ll also get tired. During vacations when you’ll do a great deal of walking. 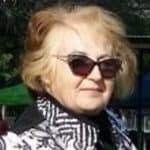 Walking around a recreation space, a large park or a lake. 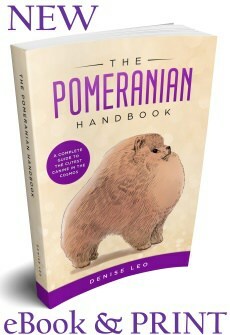 Rushing in and out of numerous shops where an easy way to care for your Pom will be essential. Shopping when you need to keep both hands free so the need to hold your pet’s leash will be a definite hindrance. Any crowded places where he may get trod on accidentally because he’s so small that people may not see him. There are lots of places in which pets are forbidden. 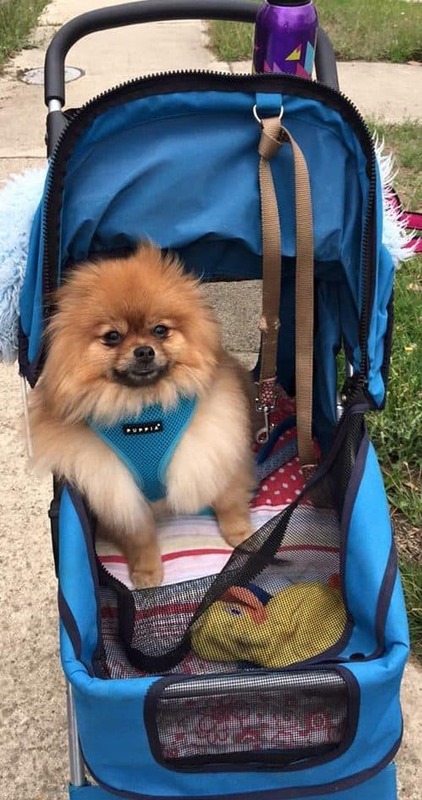 However, if your small Pom is in a backpack, sling, stroller or carrier, this rule is frequently ignored, although you may get people commenting on how adorable your Pomeranian is. The use of a sling is a great way to keep your hands free and ensure your Pom is still right with you at every turn. You don’t need to muck around with belts, Velcro or buckles and it’s a quick action to put him into a sling and take him out again. It’s designed like a curved hammock and the best way is to use it in a criss cross fashion where his weight keeps him in a safe position. Most Pomeranians love the sling because your walking rhythm and your heartbeat create a soothing feeling and instead of wriggling around, he’ll stay calm and relaxed. Slings are made from a strong fabric that enables it to be folded up and put away when you don’t need it and it’s easy to take with you to use once your Pomeranian gets tired of walking. Here are some of the better slings in which to secure your Pomeranian. Carrier crates are generally used for Poms and other small dogs for two main reasons. The first is when he’s travelling by aeroplane. Check the airline to ensure you have one that satisfies their guidelines. The other reason is when he’s sick. The vet may need to see him and a carrier crate prevents whatever illness he has from spreading to other animals. Obviously you would also prefer other Pom owners did this for their pets. Never use a carrier crate when transporting your Pomeranian in your car. It’s best to use a canine certified car seat. It’s also not recommended to use it as a “training crate” to for keeping him in when you can’t watch him. A playpen or gated area is designed for that purpose. Here are some of the best carrier crates for Pomeranians. 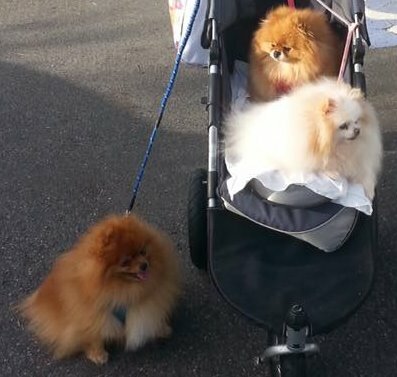 If you know you’ll be doing a lot of walking, a stroller is a great idea for your Pom as dogs love riding around in a stroller because they can see what’s going on and they can have a rest, or even a nap, if needed. You can also carry store purchases if you have other parts of the stroller designed for this purpose. 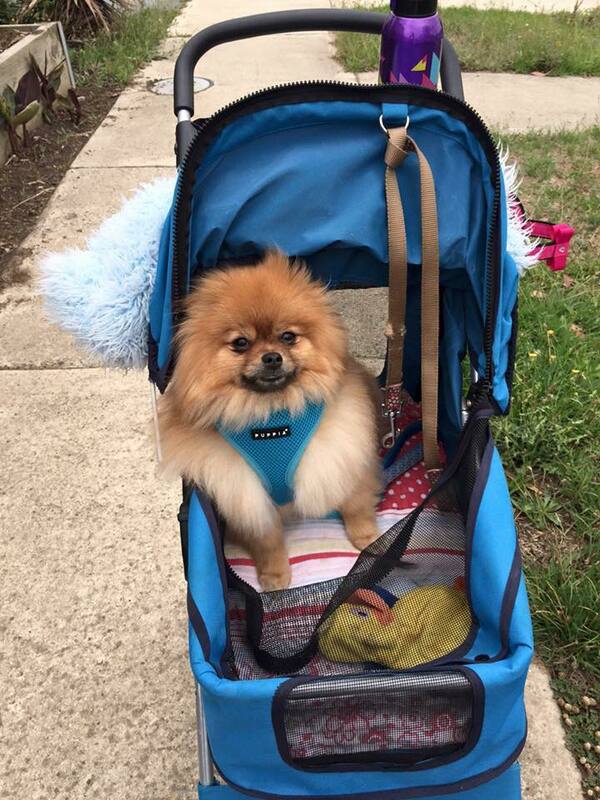 A stroller can keep your Pomeranian out of the hot sun during Summer days and you can include a few of his favourite toys to keep him amused. It may have other compartments for treats, a leash, wipes, some water and anything else you need to carry, leaving your arms free to push and browse. One terrific benefit that the best strollers have is a convertible cover that allows you to zip up a mesh window, to protect against the sun and mosquitos, and you can leave it down when desired.